What is the goal of Big Web Links Directory? Big Web Links Directory is a human edited web directory that aims to showcase the best and most popular websites on the Internet. What are some unique features of this web directory? 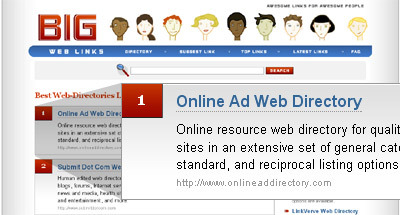 Web directories usually rank by traffic, alphabetical order, submission date, or Google PageRank. Big Web Links Directory ranks listings by the amount of dollars contributed to the listing, which offers more control for web site owners. How is that a different reflection of popularity from other web directories? Web directories usually equate the number of clicks a listing receives to popularity. For example, if more people click on a listing, that particular listing tends to remain popular in that directory simply because of its high ranking in the first place. This is hardly an accurate reflection of true popularity on the Internet. Theoretically, every website on the Internet has a chance of becoming the most popular piece of virtual real estate in cyber space. Big Web Links Directory simply attempts to reflect that by ranking websites according to the dollar amount contributed for that website. A major benefit of such a ranking system is that it provides some indication of the quality of traffic from a particular website. This is the directory where advertisers will come looking for you and visitors will find you! Does that mean an owner of a website with deep pockets can easily dominate a category? Yes. In reality, owners with deep pockets are in a better position. It is possible for a website to contribute a million dollars and stay in the number one position for eternity, but this is very unlikely. A more likely scenario would be having a popular blog with a million visits a month linking to the Big Web Links Directory. As a result, the contributions increase steadily over time, keeping it in the number one position solidly. Wouldn't it be better to rank by points? In the virtual world, it's easier to implement a point system such as voting. However, votes are but variables in a database. They cost nothing, and therefore also reflect very little. A visitor who would pay a dollar to support a website says much more about a website and the quality of its traffic. In addition, for Big Web Links Directory to achieve its goal, it must have a large enough sample in its database for the data to mean anything. Therefore, the funds generated can be put to good use by generating more traffic for the directory, which will attract new listings and benefit all existing ones. All websites need to start somewhere, so we fix a low one-time fee of USD$49.00 for all new listings. After that, anyone can add to the contribution to increase the ranking of a website. In the long run, every dollar counts. That's why anyone can contribute starting from USD$10.00 onwards. If two listings have the same amount of contribution, Big Web Links Directory will automatically rank the earlier listing higher. To contribute to an existing listing, click on "[Increase Ranking]" at the bottom of each listing. How can a listing encourage its visitors to contribute? Webmasters can do so by directing traffic to this website using simple text links. When visitors arrive, Big Web Links Directory will promote the listing by displaying a promotional message across all pages, encouraging a visitor to contribute and increase the ranking of a listing. The message will be displayed to the visitor for up to 60 days before expiring. To get the HTML code for the text link of a listing, click on "[Get Code]" beside the desired listing. Big Web Links Directory also helps by promoting the HTML link for all listings, making it available publicly for visitors to use the text links and help increase the rankings of your website. Yes, deep linking to specific pages or sub-domains is allowed. Why are there no featured links? There isn't a need for featured links in this unique directory. By default, the listing with the highest contribution stays at the top. Remember that contributions can be made by anyone. Therefore, chances of a popular website staying at the top is higher, which is somewhat similar to a featured link. I've learned enough. How do I get started? Big Web Links Directory is highly promoted and offers strong backlinks for listed web sites in addition to valuable targeted traffic. You will receive two links: one in the specified category, and one on a dedicated page. Listings for the top ten submission amounts are shown on the homepage. Get listed today and join the most popular websites on the Internet!